The "trimountaine room" at Carrie Nation restaurant and cocktail club in the Beacon Hill. 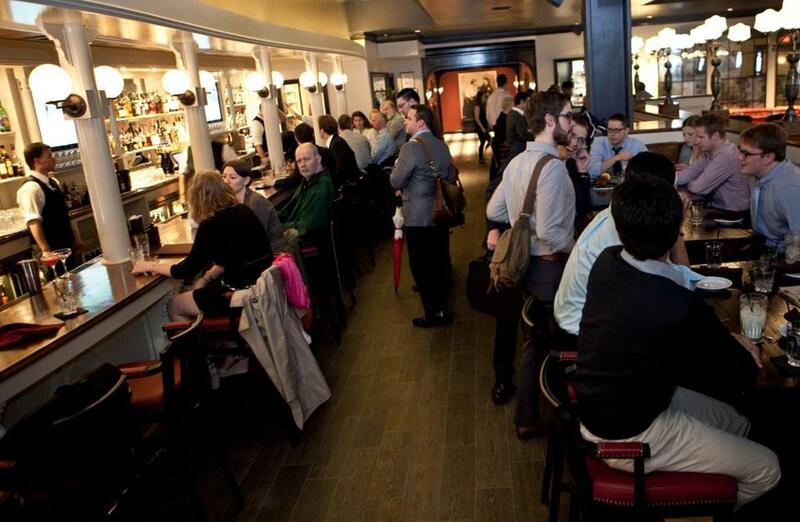 Where to Carrie Nation, a new Beacon Hill bar named for a staunch proponent of temperance who was known for attacking bars with a hatchet. Naturally. What for To indulge in Nation’s least-favorite pastime, boozing, in the shadow of the State House. Carrie Nation’s signature cocktails are categorized as “Cops & Robbers,” “Drys & Wets,” “Politicians & Power,” and so on. The scene The decor evokes the era just before Prohibition, with oxblood walls, black-and-white tile floors, velvet drapes, and period fixtures. Staff members in plasticky bowlers and sequin headbands look as though they’re wearing Halloween costumes. A man with excellent posture and a serious navy suit reads the paper and drinks a Tanqueray and tonic, placing his yellow legal pad beside him on the bar. People who work in the area greet bartenders they recognize from previous posts. A private party of young men in polo shirts and shorts fills the lounge area with boisterous noise. Spotted: a plethora of man bags. The Cheese Burger Croissant at Carrie Nation. What you’re eating Mushroom pie, a disc of flaky pastry atop chunks of chicken and mushroom. It is one of several such pastries available, containing the likes of rabbit and smoked seafood. Carrie Nation’s menu, designed by chef Karen Murphy, ranks among the most random in town. 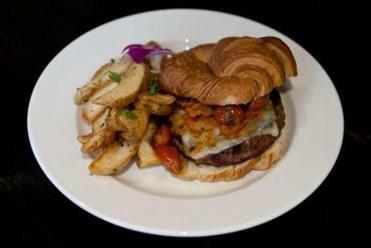 It ranges from lamb tagine to a chicken, rice, and peanut butter wrap to a cheeseburger croissant (pictured below). Overheard The music of cocktail shakers shaking. Two patrons comparing shirts: “Marshalls!” “Thrift shop!” A discussion of the merits of Red Bull vs. 5-hour Energy. A guest telling a bartender, “Someday I’m not going to drink anymore because I find I feel so much better.” Carrie Nation would approve of that, at least. 11 Beacon St., Boston. 617-227-3100. www.carrienationcocktailclub.com.